Created to celebrate the birth of my first grandchild. 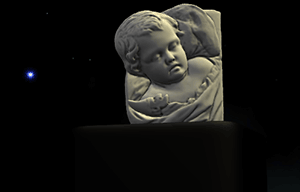 The starting model is a 3D scan courtesy of the Usher Gallery, Lincoln (UK) and Oliver Laric. The original model was triangulated and had 250,000+ vertices, but was converted to quads and reduced to 35,800+ vertices for display in a webpage using Instant Meshes. This originally started out as a test for how the Blender Babylon Exporter(BBE) would handle a simple IK rig that had been attached to a rigged character created in MakeHuman. However, after watching a video from a conference in Paris (in French), it developed into something a little more humourous (hopefully). 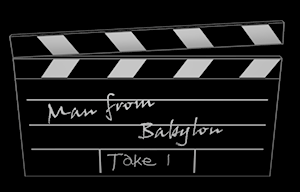 Also a test of "Append" to add two different .babylon files to a single scene. My first major creation two months after beginning experimentation with Babylon.js. The original file size for the animated mesh was 7.05Mb but huge improvements to the Blender Exporter by JCPalmer have reduced the file size to 2.72Mb. The mesh was created with MakeHuman and animated with the MalkWalk plugin for Blender. The animation itself is from The Carnegie Mellon University (CMU) BVH database available here. In 2014 a book was published claiming to have identified "Jack the Ripper" as one Aaron Kosminski by analyzing the DNA found on a "shawl" alleged taken from the scene of the murder of Catherine Eddowes (4th Ripper Victim). 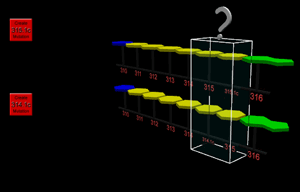 The animated model shows how the end result for a mutation at 314 or 315 would be chemically identical. 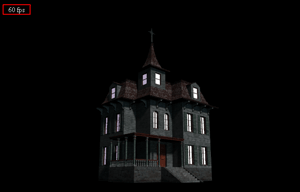 The original Blender file for this old house comes from tutorials by Michael McCann of the Wayward Art Co. The modelling techniques used for the house are very good. 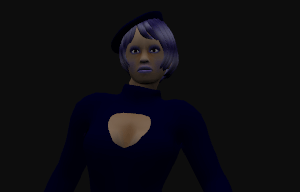 Michael provided the Blender file and gave permission to use his model as a test of BJS. The original model I got from Michael has 4 textures for the house - diffuse, normal, specular, and shadow. However, each texture is extremely large (5000+ x 5000+) - a massive browser download. 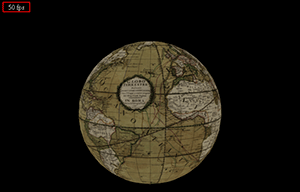 The globe makers created strips of textures called "gores" which were then glued onto a sphere. No NASA maps back then !! I used map parts available at the David Rumsey Map Collection available under this CC licence (No Commercial Use) to create the final map. You can see the 12 "gores" (segments) at the map link.